Bacon is any of certain cuts of meat taken from the sides, belly, or back of a pig that may be cured and/or smoked. Bacon may be eaten fried, baked, or grilled, or used as a minor ingredient to flavor dishes. Bacon, like ham, which also derives from the pig, has been a common and popular meat dish throughout European and Asian civilizations, except where forbidden by religious prohibitions. Its long storage life, due to the curing process, and the ready availability of pigs made it accessible to even the poor or the traveler. Despite having high fat content and relatively low protein count, the delicious, unique flavor of bacon ensures its place as an attractive and popular food. Bacon is an example of human ingenuity in developing food that is not only convenient and provides nourishment to the body, but also brings happiness to the mind and spirit. The word bacon is derived from the Old High German word bacho, meaning "back," "ham," or "bacon." The United States Department of Agriculture (USDA) defines bacon as "the cured belly of a swine carcass," while other cuts and characteristics must be separately qualified (such as "smoked pork loin bacon"). "USDA Certified" bacon means that it has been treated for trichinella. Bacon has one of the highest fat contents of any cut of meat. Bacon may be taken from the side, belly, or back of a pig. Meat from other animals, such as beef, lamb, chicken, goat, or turkey, may also be cut, cured, or otherwise prepared to resemble bacon. It is preserved by being salted or pickled and then dried. Many people prefer to have bacon smoked using various types of woods or turf. This process can take up to ten hours depending on the intensity of the flavor desired. Traditionally, the process consisted of soaking the pork in brine or rubbing it in a salt mixture by hand, then smoking the sides in smoke from an open chimney. This sometimes took as much as three or four months. Bacon continues to be home cured in some rural communities, but the bulk of its manufacture is carried on in large industrial meatpacking plants that slaughter, dress, cure, smoke, and package on a large scale. Bacon was a staple meat for European peasants for many centuries. Its long storage life, due to the curing process and the ready availability of pigs, made it accessible to all. It was the first meat to become an important international trade commodity. In the twelfth century, a church in the English town of Dunmow promised a side of bacon to any married man who could swear before the congregation and God that he had not quarreled with his wife for a year and a day. A husband who succeeded was held in high esteem by the community for his forebearance. The phrase to "bring home the bacon" reflects this tradition. And the swine … he is unclean unto you. Of their flesh shall ye not eat, and their carcase shall ye not touch; they are unclean to you. Bacon made from the meat of other animals may, however, be eaten by adherents to these faith traditions. Beyond bacon's low nutritional value, its high fat content is a health concern. Also, bacon, like other cured meats, contains sodium nitrite which serves a dual purpose in altering the color of preserved fish and meats and preventing growth of Clostridium botulinum, the bacteria which causes botulism. This food additive is the cause of a number of health concerns. Studies have found a link between high processed meat consumption and colon cancer, possibly due to preservatives such as sodium nitrite. A link between frequent ingestion of meats cured with nitrites and the Chronic obstructive pulmonary disease (COPD) form of lung disease has also been suggested. However, bacon also has a unique, smoky flavor that continues to prove attractive, assuring its place as a favorite food for many occasions. Who, under any circumstances, is not rendered almost helpless by the tantalizing sound of bacon sizzling slowly in a skillet, by the taunting backwoods aroma that permeates the air…? Bacon is enjoyed for its smoky flavor and is a favorite with eggs, particularly as part of breakfast. Its unique flavor also makes it an excellent garnish or ingredient in a wide variety of dishes. 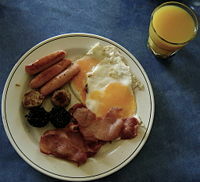 An Irish breakfast consisting of sausages, black and white pudding, bacon, and fried eggs, served with a glass of orange juice. Bacon is an essential item in a full British breakfast, which comprises at its heart bacon and eggs, and is popular throughout the British Isles and other parts of the English-speaking world. 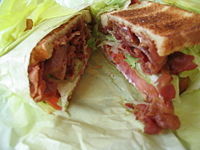 The popular "BLT" is a variety of sandwich containing Bacon, Lettuce, and Tomato. The sandwich traditionally has about three strips of fried bacon, leaves of lettuce, and slices of tomato, all sandwiched between slices of bread or toast which is commonly spread with mayonnaise. In the United States and Europe, bacon is often used as a condiment or topping on other foods. Streaky bacon is more commonly used as a topping in the U.S., on items such as pizza, salads, sandwiches, hamburgers, baked potatoes, hot dogs, and soups. Back bacon is used less frequently in the United States, but can sometimes be found on pizza, salads, and omelets. Bacon bits are chopped pieces of pre-cooked bacon intended to be sprinkled over foods, particularly salads. Imitation "bacon bits" made of texturized vegetable protein flavored to resemble authentic bacon bits are also popular. Bacon frying in bacon grease. Bacon grease, also known as bacon drippings, is the grease created by cooking bacon. When bacon is cooked, its fat naturally melts, releasing a highly flavorful grease. 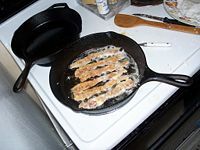 Bacon grease is traditionally saved in southern U.S. cuisine and used as an all-purpose flavoring for a very large variety of foods. It is used for everything from gravy for cornbread to salad dressing. One teaspoon (4 grams) of bacon grease has 38 calories. It is composed almost completely of fat, with very little additional nutritional value. Bacon fat is roughly 40 percent saturated. Despite the health consequences of excessive bacon grease consumption, it still remains quite popular in the cuisine of the American South. An individual slice of bacon is known as a "rasher" (United Kingdom, Republic of Ireland, Australia, and New Zealand) or simply a "slice" or "strip" (North America). Slices of bacon are also known as "collops," a term derived from the French escalope. 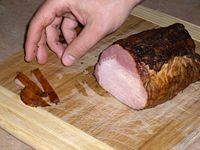 Traditionally, the skin is left on the cut and is known as "bacon rind." Rindless bacon, however, is quite common. In the United Kingdom and Republic of Ireland, bacon comes in a wide variety of cuts and flavors. In the United States ordinary bacon is made only from the pork belly, yielding what is known in Britain as "streaky bacon," or "streaky rashers." In Britain, bacon made from the meat on the back of the pig is referred to as "back bacon" or "back rashers" and usually includes a streaky bit and a lean ovoid piece. In the United States, back bacon is called "Canadian-style bacon" or "Canadian bacon" but this term refers usually to the lean ovoid portion. What the U.S. terms Canadian bacon is actually back bacon rolled in cornmeal. In Canada, this is called peameal bacon, whereas bacon is used generally to refer to strip bacon, which is more common to the Canadian diet. In continental Europe, bacon is used primarily in cubes (lardons) as a cooking ingredient valued both as a source of fat and for its flavor. Bacon is often used for barding and larding roasts, especially game birds. Tarte flambée is an Alsatian dish composed of thin bread dough rolled out in a circle or a rectangle, which is covered by crème fraîche, onions, and bacon. It is one of the most famous gastronomical specialties of the region. Depending on the area of the region, this dish can be called in Alsatian flammekueche, in German Flammkuchen, or, in French, tarte flambée. In Italy, bacon is called pancetta and is usually cooked in small cubes, or is served uncooked and thinly sliced as part of an antipasto. When served on its own, the rolled pancetta is presented in very thin slices. More often it is used to flavor other dishes, especially pasta sauces. In Spain, where it is called panceta, medium to long and relatively thick portions are also served as a side dish, usually fried in olive oil or its own fat. Fried eggs with chorizo and panceta is considered a popular hearty breakfast in some rural parts of the country. Guanciale is another kind of unsmoked Italian bacon prepared from pig's jowl or cheeks. The name is derived from guancia, Italian for cheek. It is prepared by rubbing pork cheek with salt, ground black pepper or red pepper and curing for three weeks. It has a stronger flavor than other pork products, such as pancetta, and its texture is more delicate. Guanciale is traditionally used in pasta dishes. It is a delicacy of Central Italy, particularly Umbria and Lazio. Korean samgyeopsal being grilled with sliced onions and garlic on a hot plate. In Korea, one of the most popular cooked meats is grilled unsmoked pork belly called samgyeopsal (삼겹살), which literally means "three layered flesh" reflecting the three layers that are visible in the meat. 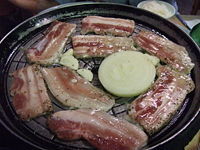 Commonly served as an evening meal, it consists of thin slices of pork belly meat (similar to uncured bacon), served with the meat flavored with garlic, salt, and sesame oil and cooked on a grill. Like most traditional meat dishes in Korea, as galbi, it is grilled at the table either by the customer or a waitress and eaten communally. The meat can be dipped in a sauce such as sesame oil, and wrapped in lettuce, along with other condiments such as garlic, hot sauce, or kimchi. A slice of cooked meat is placed inside a leaf of lettuce or some other green leafy vegetable, along with some cooked rice and ssamjang (a paste made out of a mixture of various ingredients, including chili paste, gochujang, and soybean paste, doenjang), and eaten out of one's hand. Usually side dishes of vegetables are served. It is also common to serve large green chilies, which are not spicy, and slices of raw garlic which are dipped in ssamjang, as well as a spring onion salad with the meal to relieve the greasiness of the pork. Soju, a Korean alcoholic beverage, is often served with samgyeopsal. 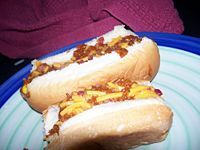 The dish is a very common meal for families or office workers having dinner after work. Its popularity of this meat owes as much to the lower price of pork belly compared to other cuts of meat as it does to the taste, which many Koreans love. ↑ United States Department of Agriculture, Food Safety, and Inspection Service, USDA Food Safety and Inspection Service: Glossary B. Retrieved July 9, 2007. ↑ Peggy Trowbridge Filippone, Bacon History, About.com: Home Cooking. Retrieved June 6, 2008. ↑ USDA, Agricultural Research Service, Nutrient Data Laboratory, USDA National Nutrient Database for Standard Reference. Retrieved July 12, 2007. ↑ A.W. Susanna and C. Larsson, "Meat consumption and risk of colorectal cancer: A meta-analysis of prospective studies," International Journal of Cancer 119 (11) (2006): 2657-2664. ↑ Miranda Hitti, Study: Cured Meats, COPD May Be Linked, WebMD Medical News. Retrieved June 6, 2008. ↑ James Villas, The Bacon Cookbook: More than 150 Recipes from Around the World for Everyone's Favorite Food (Wiley, 2007, ISBN 978-0470042823). ↑ Irma Rombauer and Marion Rombauer Becker, "Pan Gravy," The Joy of Cooking (Penguin Group, 1964, ISBN 0452263328). ↑ Alton Brown, Bacon Vinaigrette with Grilled Radicchio, Food Network. Retrieved June 6, 2008. ↑ 9.0 9.1 Nutrition Data, Nutritional Summary for Animal fat, bacon grease. Retrieved June 6, 2008. ↑ Cattleman's Beef Board & National Cattlemen's Beef Association, Uniform Retail Meat Identity Standards. Retrieved July 9, 2007. ↑ Canadian Bacon, Homepage. Retrieved June 6, 2008. Pruess, Joanna. Seduced by Bacon: Recipes & Lore about America's Favorite Indulgence . The Lyons Press, 2006. ISBN 1592288510. Rombauer, Irma, and Marion Rombauer Becker. The Joy of Cooking. Penguin Group, 1964. ISBN 0452263328. Villas, James. The Bacon Cookbook: More than 150 Recipes from Around the World for Everyone's Favorite Food. Wiley, 2007. ISBN 978-0470042823. This page was last modified on 5 May 2016, at 14:33.